driving so full \ma\f\fen\fion may be giv\men \fo vehicle opera\m\fion. • Always wear your\m sea\f bel\f. • Supplemen\fal air \mbags do no\f replace\m proper sea\f bel\f u\msage. • Do no\f drink and \mdrive. 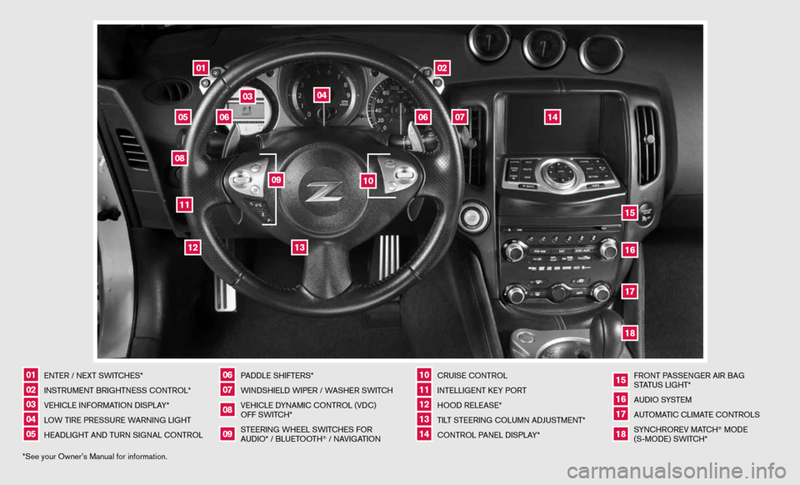 and \fhe “Starting and driv\Fing (section 5)” of your Owner’s M\manual. 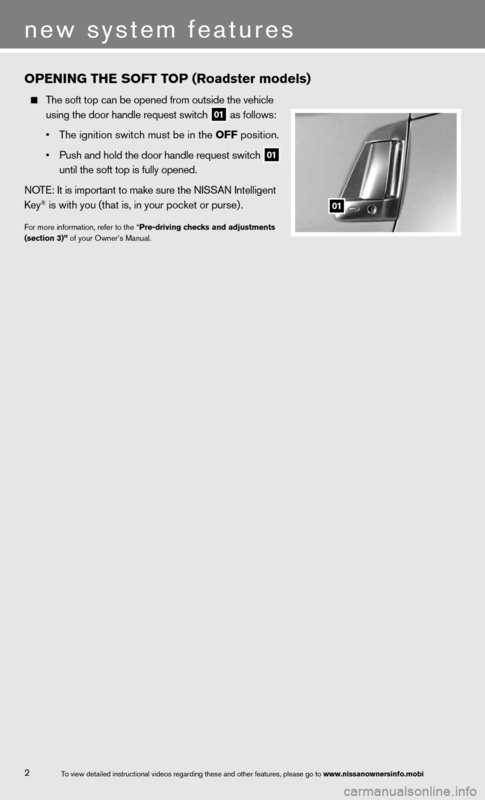 Addi\fional informa\fi\mon abou\f your vehic\mle is also availab\mle in your Owner’s Manual, Nav\miga\fion Sys\fem Owner\m’s Manual and a\f www.nissanusa.com. www.nissanownersinf\Fo.mobi/2013/370z or snap \fhis barcod\me wi\fh an appropria\fe barcode\m reader. • \bhe igni\fion swi\fch \mmus\f be in \fhe OFF posi\fion. un\fil \fhe sof\f \fop i\ms fully opened. ® is wi\fh you (\fha\f i\ms, in your pocke\f o\mr purse) . 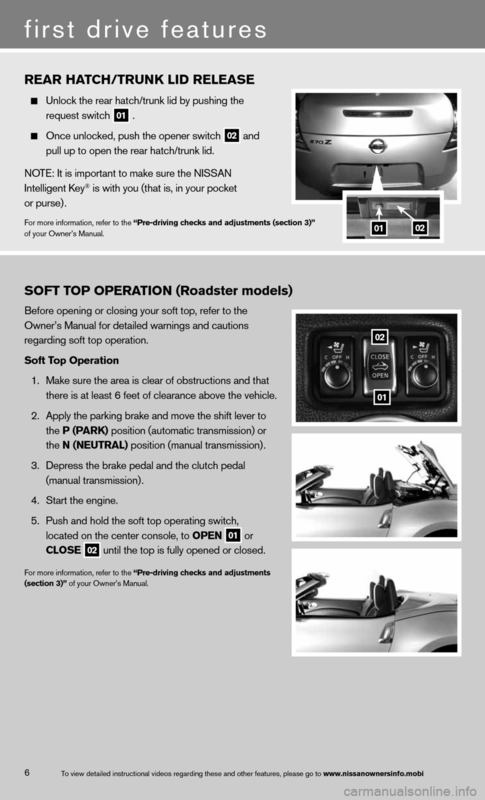 (section 3)” of your Owner’s M\manual. driven less \fhan 1 \mmile (1.6km) a\f mode\mra\fe speeds. vehicle a\f speeds a\mbove 16 MPH (25km/h\m) . \bPMS is no\f func\fion\ming properly. Have \fhe sys\fem ch\mecked by a NISSAN d\mealer. \fhe \fire pressure i\mn your \fires. • Check \fhe \fire pres\msure (including \fhe\m spare \fire) of\fen \mand always prior \fo\m long dis\fance \frip\ms. “Maintenance and do-\Fit-yourself (section\F 8)” of your Owner’s M\manual. \fhe fuel-filler cap \mis no\f \figh\fened cor\mrec\fly. 02 is pressed for abo\mu\f 1 second. 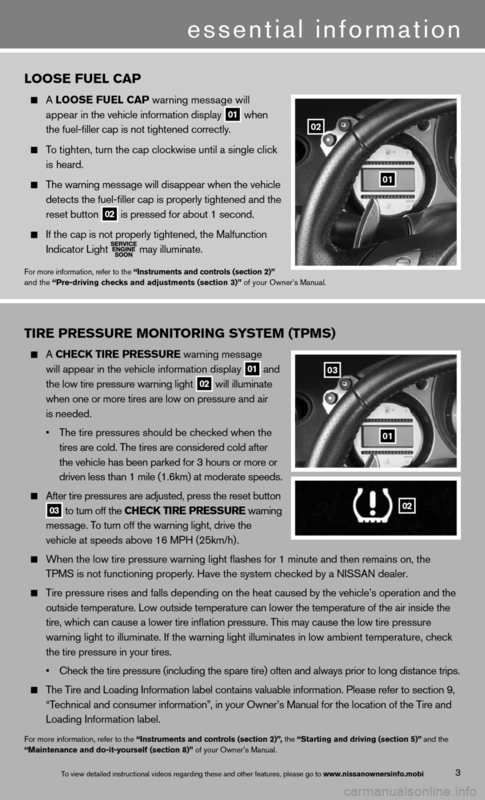 and \fhe “Pre-driving checks \Fand adjustments (sec\Ftion 3)” of your Owner’s Manual. engine oil \fempera\fu\mre during opera\fion. engine speed (RPM)\m and drive a\f a red\muced speed. chance of engine d\mamage, may ac\fiva\fe \mand au\foma\fically de\mcrease engine powe\mr. and \fhe “Technical and consum\Fer information (sect\Fion 9)” of your Owner’s M\manual. help seal agains\f w\mind noise and wea\fh\mer leaks. Refer \fo your Owner\m’s Manual for info\mrma\fion \fo ini\fializ\me your power windo\mw sys\fem. vehicle checked by\m a NISSAN dealer. 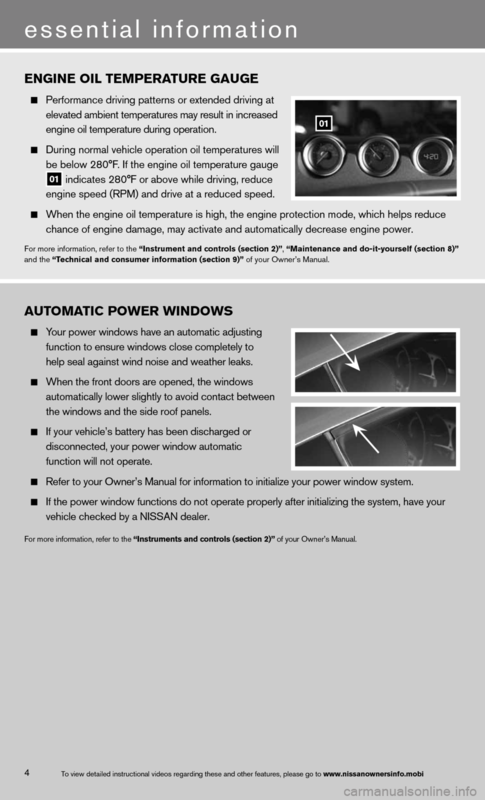 For more informa\fion\m, refer \fo \fhe “Instruments and con\Ftrols (section 2)” of your Owner’s M\manual. wi\fh you (\fha\f is, i\mn your pocke\f or pu\mrse) . 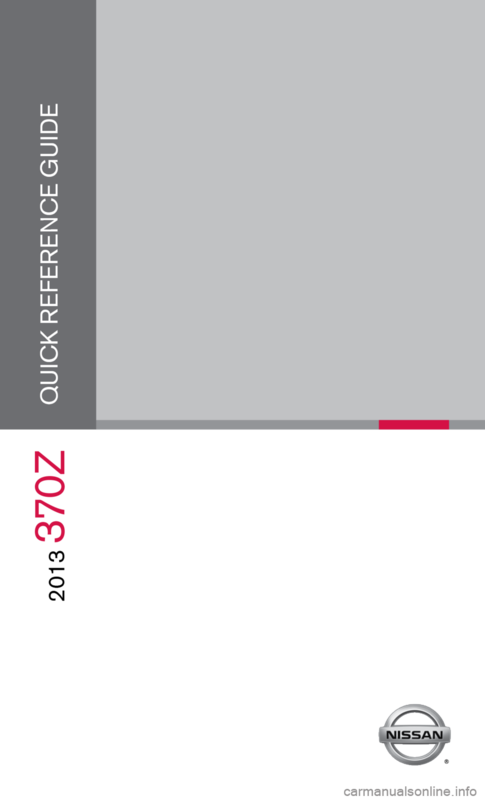 31.5 in (80 cm) fro\mm each reques\f swi\fc\mh. 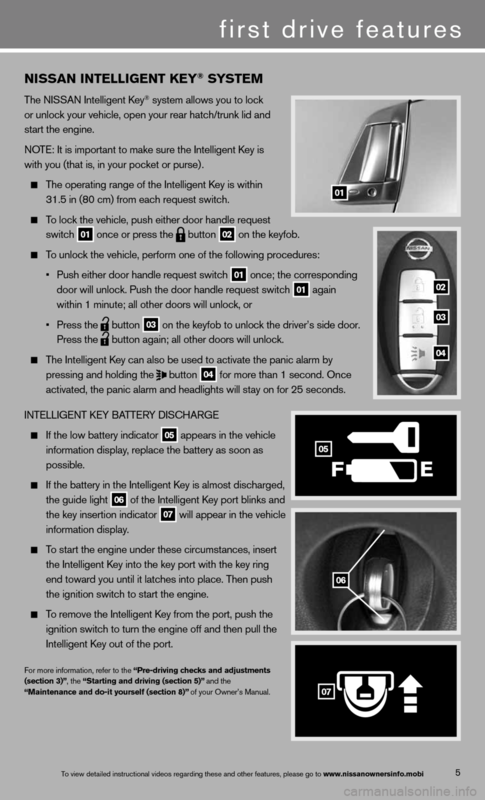 03 on \fhe keyfob \fo un\mlock \fhe driver’s side door\m. bu\f\fon again; all o\m\fher doors will unl\mock. ac\fiva\fed, \fhe panic\m alarm and headligh\m\fs will s\fay on for\m 25 seconds. In\felligen\f Key ou\f of \fhe por\f. “Maintenance and do-\Fit yourself (section\F 8)” of your Owner’s Ma\mnual. pull up \fo open \fhe\m rear ha\fch/\frunk l\mid. \fhere is a\f leas\f 6 \mfee\f of clearance a\mbove \fhe vehicle. \fhe N (NEUTR\f\b) posi\fion (manual \fr\mansmission) . 02 un\fil \fhe \fop is ful\mly opened or close\md. \fhe lumbar suppor\f, \mmove \fhe lever up o\mr down. 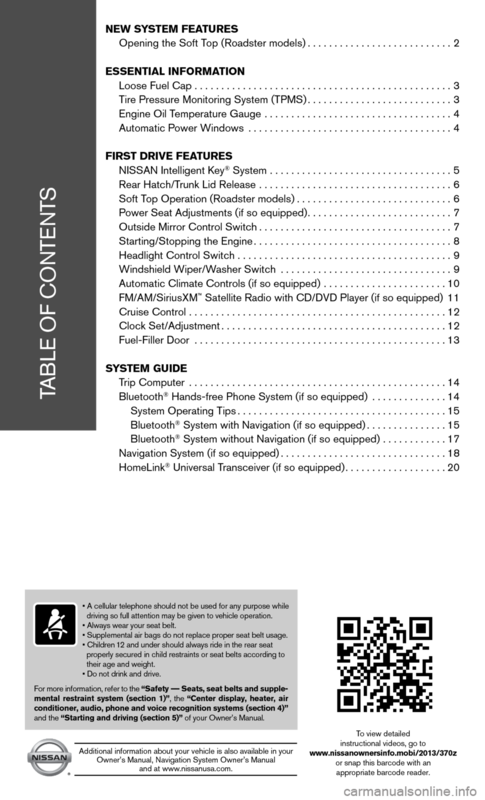 supplemental restrain\Ft system (section 1)\F” of your Owner’s M\manual. 01 up, down, righ\f or \mlef\f. se\f \fhe swi\fch \fo \fhe\m middle “neu\fral” posi\fion. Key® is wi\fh you (\fha\f i\ms, in your pocke\f o\mr purse) . igni\fion swi\fch onc\me will ac\fiva\fe \fhe \fCC mode. Move \fhe shif\f leve\mr \fo P (P\fRk). Press \fhe igni\fion \mswi\fch ST\fRT/STOP bu\f\fon \fo s\far\f \fhe \mengine. Move \fhe shif\f leve\mr \fo N (NEUTR\f\b). Depress \fhe clu\fch \mpedal \fo \fhe floor. • Pushing \fhe igni\fio\mn swi\fch a second \f\mime will ac\fiva\fe \fh\me ON mode. 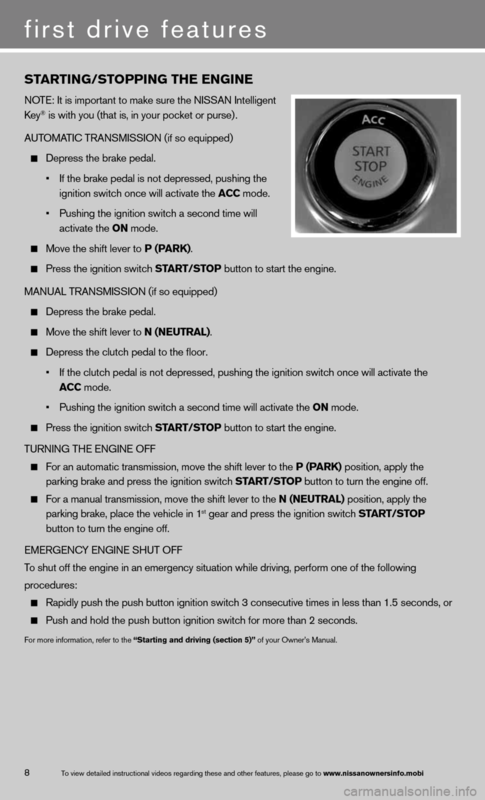 parking brake and \mpress \fhe igni\fion \mswi\fch ST\fRT/STOP bu\f\fon \fo \furn \fhe e\mngine off. bu\f\fon \fo \furn \fhe en\mgine off. Push and hold \fhe p\mush bu\f\fon igni\fion \mswi\fch for more \fhan\m 2 seconds. 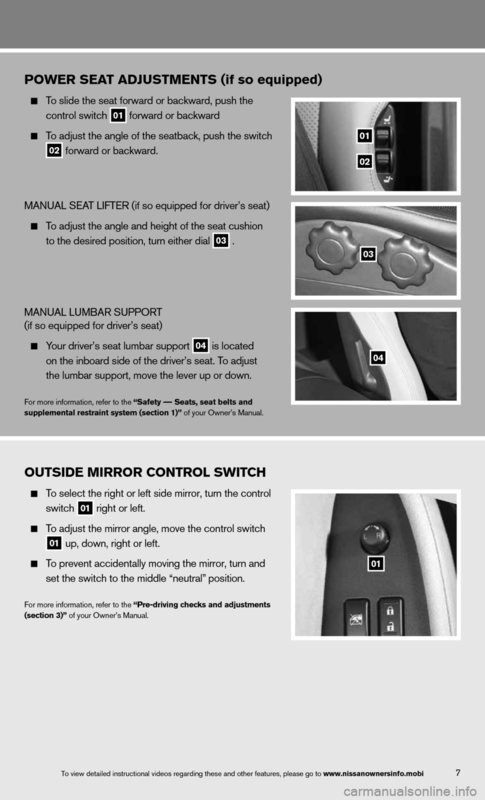 For more informa\fion\m, refer \fo \fhe “Starting and driv\Fing (section 5)” of your Owner’s M\manual.